Over the many years, I had only heard about it from different people, trek and nature enthusiasts but got a chance to visit it only this year (it also was my first trip of 2019). 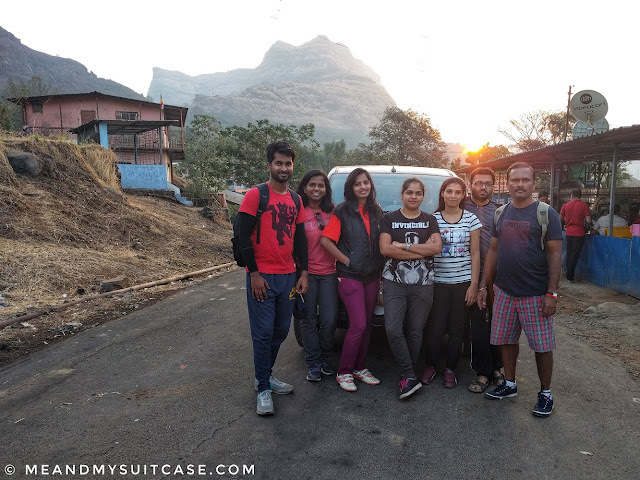 Second week in the new year, I hopped in with 6 more trek enthusiasts in a Mahindra Xylo to Raigad. The journey started on Friday evening and we didn't realize how 5 hours passed away, playing games, picking on each other, singing and fighting. At 2200 hours through tumultuous roads of western ghats we reached our stay, Dhruvtara in Pachad Village (don't expect anything fancy in this area, it is a village with a few houses converted in to hotels / dormitories) where we were welcomed to the hot desi food - bhakri and pitla with onion, pickle and green chilies (Believe me it tastes heavenly, you should try it some time). We were so tired after the long journey that as soon as we hit the bed, we were snoring loud and clear. Next morning when the alarm rang, which we all heard but conveniently tried to ignore as no one was ready to come out of bed. While we were procrastinating, our team leader Sachin Sir banged on the door. One bang and we all replied in unison, "Sir we are all awake, getting ready". We got ready and assembled downstairs to begin our day with a visit to the temple of Jijabai (mother of Chhatrapati Shivaji Maharaj). The sun was yet to rise when we reached Jijabai Samadhi. It's a peaceful place nestled among the greenery. 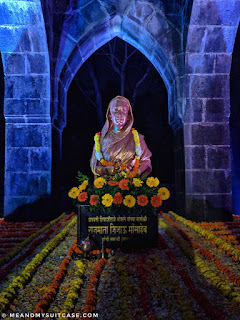 Since, it was her birth anniversary on that day it was decorated in flowers and lights. After spending some time there we came back to our abode for breakfast after which we left for Raigad base from where the ropeway trolley to Raigad fort is available. One can trek up to the fort as well but we planned to go by ropeway for the experience as well as to save time. On our way back we took the trek route. Raigad is a district in Maharashtra's Konkan region. 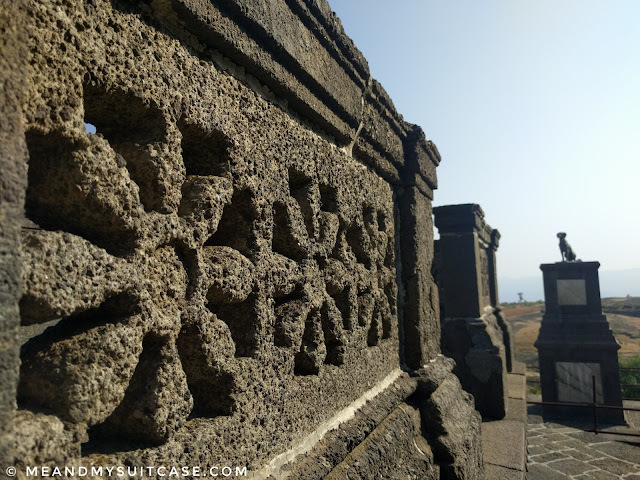 It was known as Coolaba before the name was changed to its present one during the reigns of Shivaji Maharaj under whom Raigad fort was built. It was a kingdom of Maratha empire. 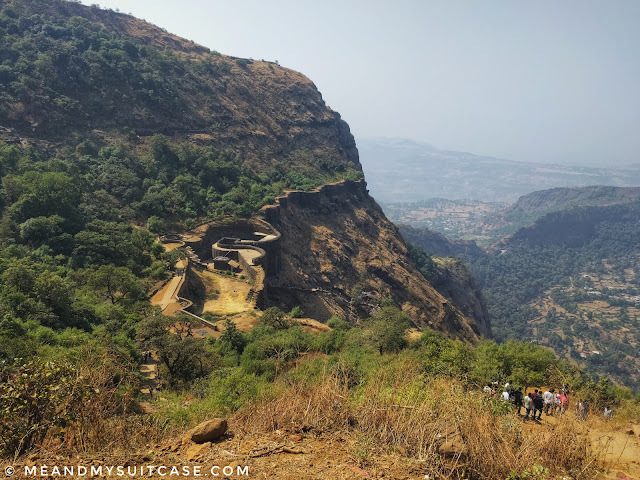 Situated in Mahad (Raigad district), it is a hill fort. The place was seized by Chatrapati Shivaji Maharaj in 1656 (then known as Rairi fort) and under him it was renovated and expanded (name changed to Raigad Fort). In 1674 it was made the capital which was when he was also crowned the king. During his time it became an empire from kingdom and covered most of central and western India. Raigad fort is located in the Sahyadri mountain range with 1737 steps leading to it. It is 820 meter above sea level and has a stellar view. It has two main villages at the base viz. Pachad and Raigadwadi. The chief architect / engineer of the fort was Hiroji Indulkar. The main palace was constructed in wood but what you can see now is only the base pillars. 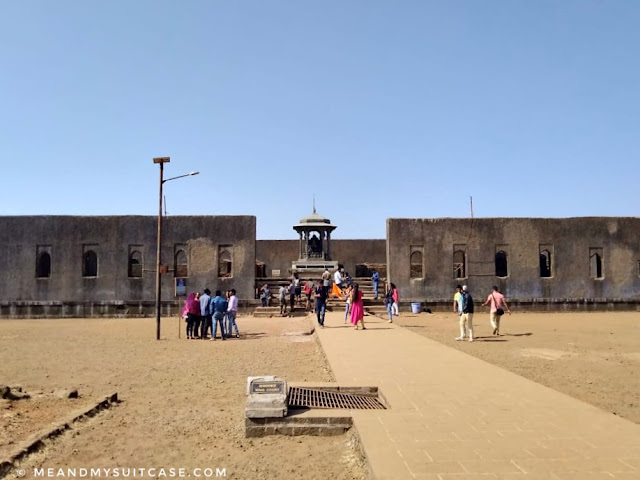 The fort ruins inter alia consists of Queens' quarters, Watch towers, Market place, Jagdishwar temple, Ganaga Sagar (artificial) lake, Nagarkhana, Rajsadar, Chamber for Secret discussion, Hirkani Buruj to name a few. The fort is huge and from here you can see almost everything and up to many kilometres. There are many stories associated with the fort, its many chambers and sites but the story which intrigued and impressed me the most was the story of Hirkani. 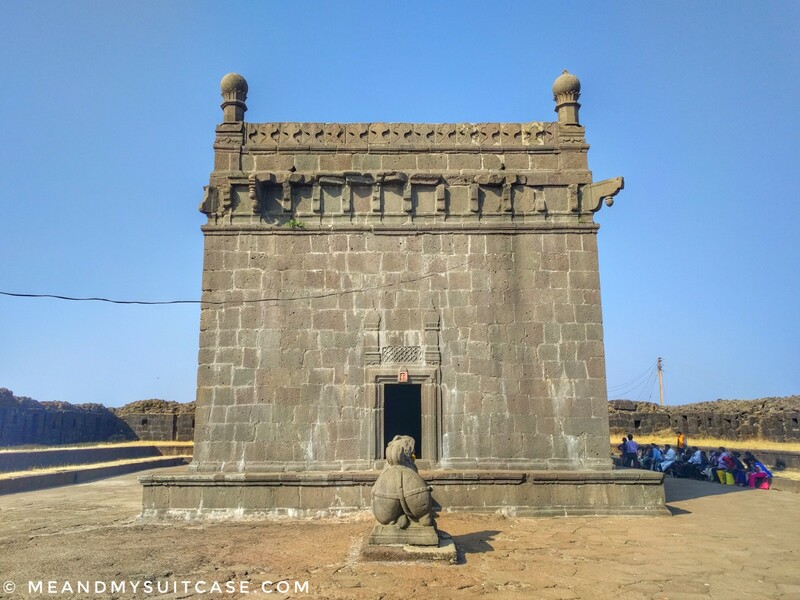 When Chatrapati Shivaji acquired Raigad fort, he made his goal to make it impregnable. 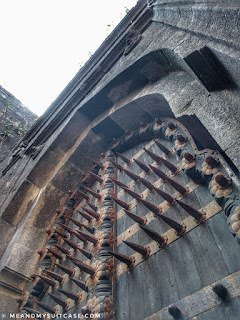 With his engineer / architect Hiroji Indulkar he developed an impressive fortress on the steepest mountains of Sahyadri range which no mortal could ever break into or exit without gate keepers knowledge, watch towers to keep an eye and suicidal cliffs and huge walls encompassing everything inside. Main gates would allow villagers in and out every morning and evening, none otherwise. It is believed that even ants would dare enter once the doors closed in evening, even birds would go back to their nests in the forest as sun dipped. In short, it was impossible to breach the fortress, in any manner, such was its construction. Then there was a woman named Hirakani who came to the fortress every day to sell milk. 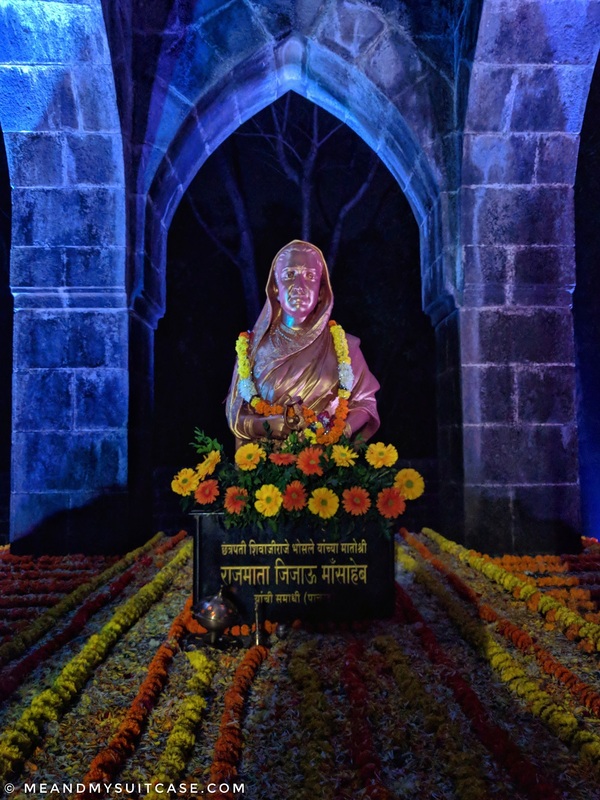 She had a baby at home in the foothills of the fort, her husband worked in the army of Maharaj and while she sold milk during the day time her baby was taken care of by her mother in law who was very old and could not manage the child for long duration. Hirakani had to make it home on time everyday to take care of her baby. One day she got held up in the fort helping her friend deliver baby. As she left, the sun had started to set and it was time for the closing of doors. She ran for her life, as she neared the doors were closing but she couldn't make it before they were sealed for the night. She pleaded but rule is rule, even though she was coming to the fort from many years, no mercy was shown to her. After many failed attempts to cajole guards, she took matters in her own hands. Thinking about her baby who would be anxious for mother and crying, hungry may be, she left and started walking in the other direction determined to reach back home to her baby. There was one slight area which was missing wall but it was also one of the steeper cliffs around the fort. It was humanly impossible to climb that down. The sun had already set and in pitch dark she could only see the thorny shrubs. Holding them one after the other she started her descent. 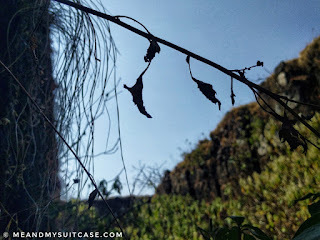 The sharp shrubs pierced through her skin and edgy mountain would hurt her feet but nothing could hinder her resolution. Even the thought of wild animals and even snakes who would show in the area could not dampen her spirits. The image of her kid made her more fierce which made her surpass all hurdles. She finally made to her home and her kid even escaping the soldiers patrolling the fortress and surrounding areas. The next morning when she went to fort again to sell milk, the guards who had disallowed her to leave the fort, were shocked to see her coming in. On inquiring, she narrated her story from last night. Guards did not believe her and took her to Maharaj. Shivaji Maharaj was perplexed when he heard the story, he along with the guards commanded Hirakani to the same spot from where she had climbed down. On reaching she was aghast when she looked down. On asking if she could do it again she bowed down and said she would not dare go down this dangerous steep mountain through those thorny bushes. She admitted that it was her love and worry for the baby that she could successfully descend but the same site now made her dizzy. She was shocked to see the surrounding which she could not at night, it was dangerous she could only comprehend that now. She was scared that she would be punished and Shivaji Maharaj did punish her but in a way which no one could imagine. He ordered to construct a watch tower at the very same spot. He opined if an untrained soul can do it, then it is not a difficult feat for a trained being. He also named the watch tower after the woman who dared and made impossible possible, it is called Hirakani Buruj. The aura of the site resonates with the courage, motherly love and greatness of Hirakani. The story of Hirakani is so touching and overwhelming. In fact, Hirakani Buruj was not only tribute to the courage of Hirakani, I believe it was to all the courageous mothers who selflessly sacrifice everything for their children without blinking an eye. My experience up there was immensely satisfactory and pleasant. Hirakani Buruj, watch towers, jagdishwar temple and tak mak point (A point on cliff from where people were thrown as punishment. It is believed that only one person got that punishment during Shivaji Maharaj's reign) became my instant favorite. I loved strolling through the grand market area, and the trek down the hill was phenomenal. The paths were narrow and too sandy. 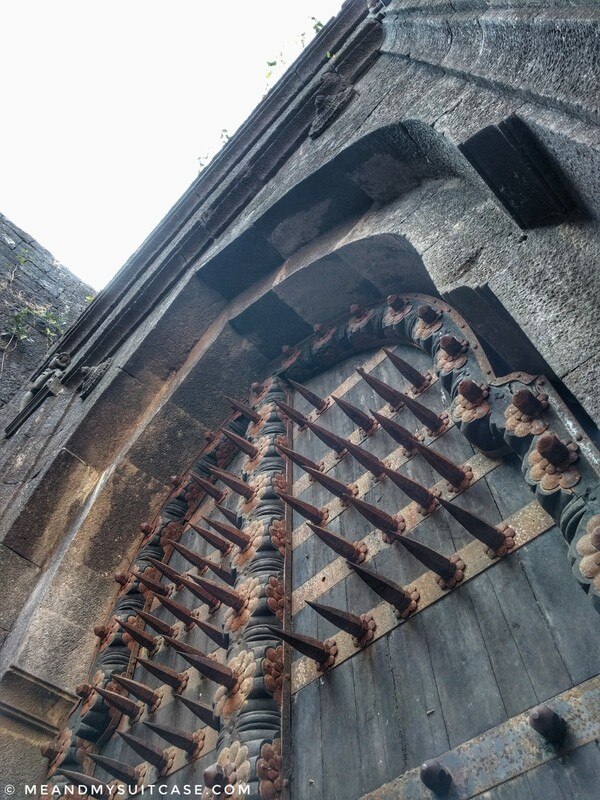 Crossing through the main doors with piercing - pointed nails through out the door surface made me feel tiny and curious, the doors took me back in history. The view down from the fort and view up of fort from the foot hills is a contrast. It was a hectic yet mesmerizing experience. Each moment was bewildering with stories and anecdotes like cherry on top. 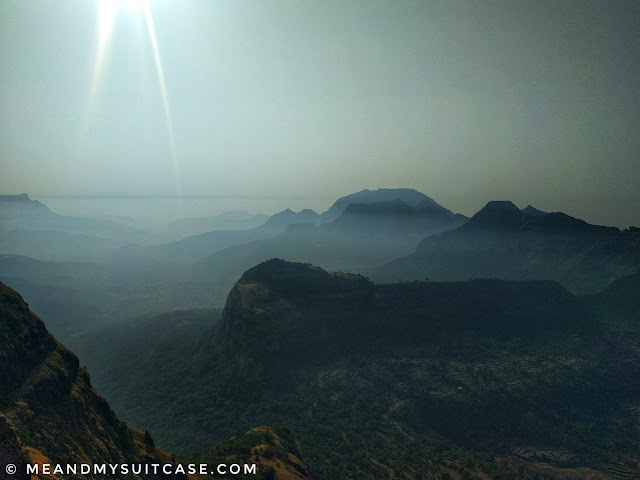 To add, Sahyadris are considered to be one of the tougher ranges to trek, even the rope way to Raigad fort is considered one of the dangerous rope ways. I suggest you enjoy both ropeway and trek. Also, please note that MTDC resort used to be there where you could stay and enjoy the night as well, but now remains only its ruins. I had an amazing experience, you should go and one too. P.S. All pictures are mine unless otherwise mentioned. It's good to know that you are enjoying trekking. 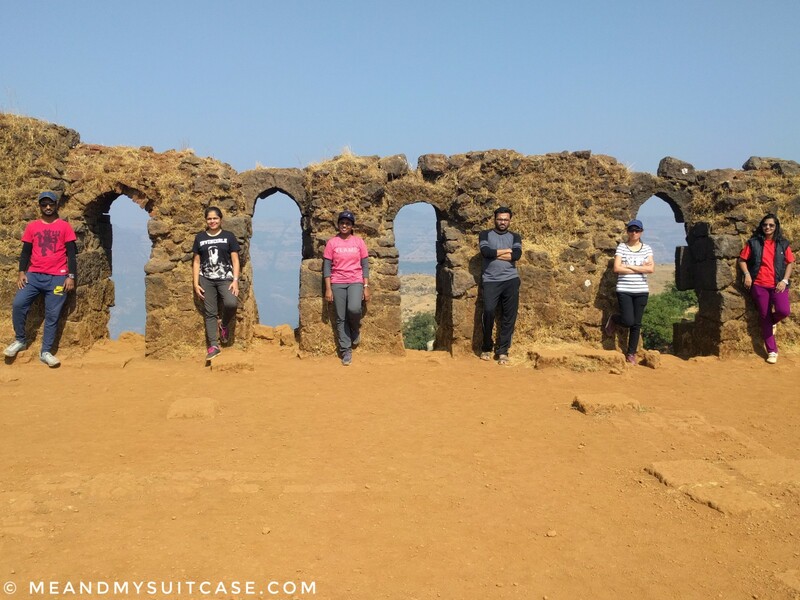 Raigad fort looks like a good place to trek. The story of Hirakani is so interesting. She was such a brave lady! once a year, I do visit this Place!. Its different in summer, winter and in monsoon! do visit in monsoon!! I loved reading the story of Hirakani. What a great area to visit. 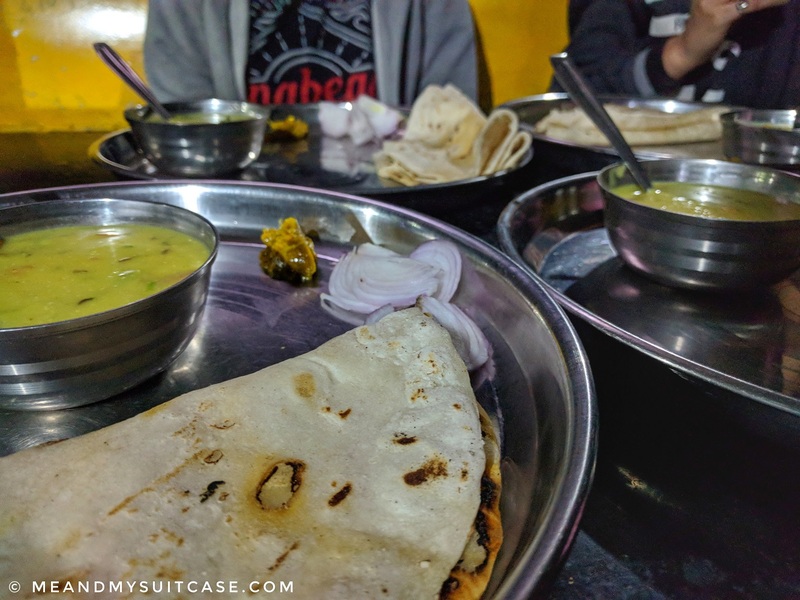 I would love to try the hot Desi food - looks like my favourite food. Your photos were amazing. Knowing the context behind Hirakani must make the experience of visiting the site so much more powerful. This adventure sounded great! This is such a beautiful area. The fort is gorgeous, and I love hearing the history. I don't think we could do this with our little ones, but we will add it to the list. You can take the cable cat to and fro. I am sure your kids will love it. 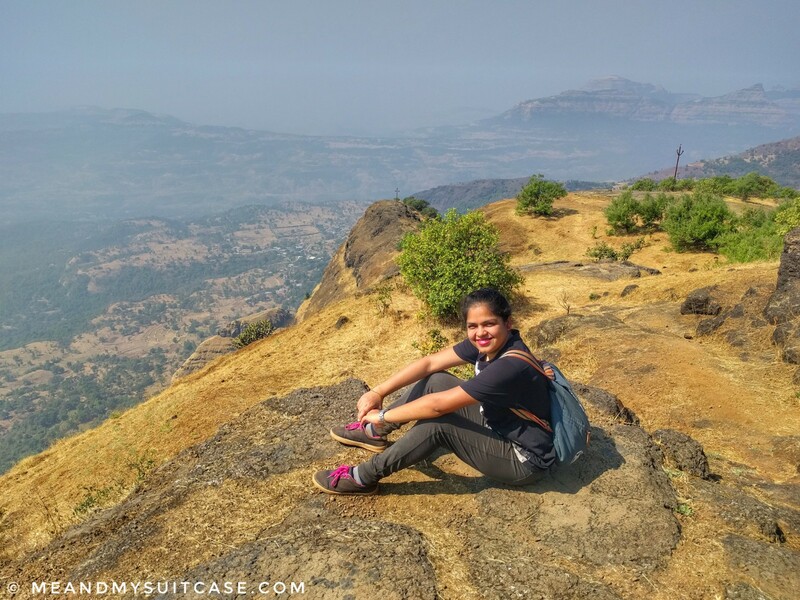 I trekked Raigad two years ago and it was amazing! This article brought back so many nice memories. Seems like you had an awesome adventure- it was really interesting reading about it. 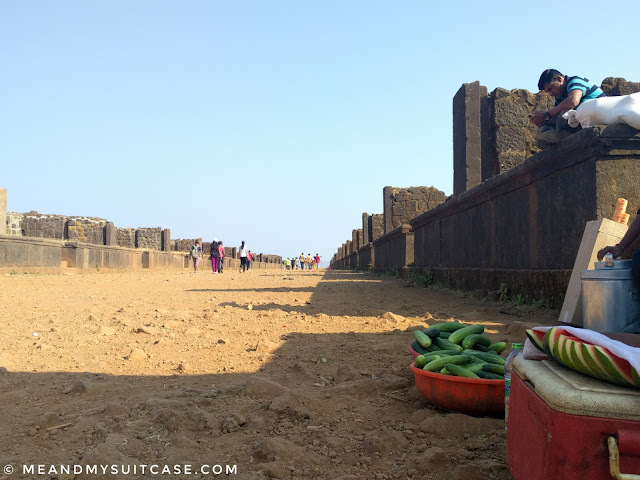 I haven’t heard of Raigad Fort before but it sounds like it’d be really interesting to visit! Indian forts always fascinate me, there’s so much history behind them. I’ll definitely remember this next time I’m in Maharashtra, thanks for sharing! You're a great storyteller! I love how you capture Raigad Fort. I haven't heard of this fort before, so I was very interested in what you had to say. 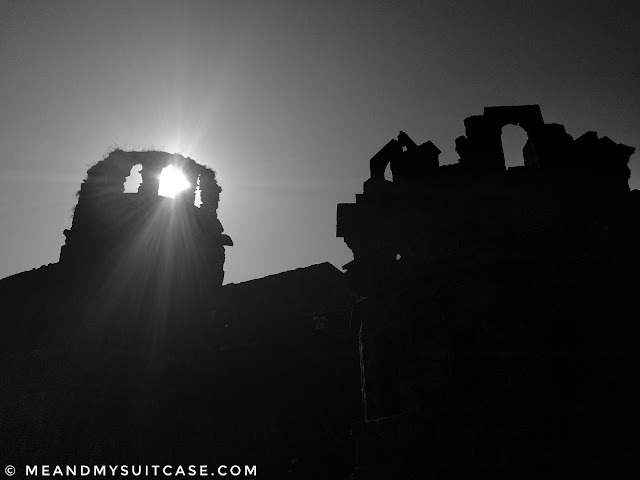 I love the architecture of this fort and it has a very powerful essence to it. This sounds like a fabulous trek! Thank you Martha, means alot. This place looks very special! The architecture is beautiful and the story definitely interesting. It reminds me of a trek I did in Sri Lanka, but without way less tourists, which is always nice! I have been to Raigarh fort during monsoon. It was in fact one of my initial trips in Maharashtra. I loved it. We went via cable car though. I would love to trek also on this trail. Nice blog.